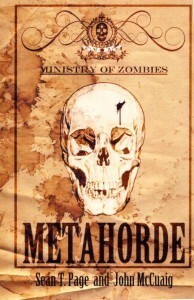 Meta-horde, by Sean T Page and John McCuaig, is definitely a book that zombiephiles will want to add to their collections. If not for the POVs of the characters from time to time, this novel almost reads like a history book. Between fighting a meta-horde of over a million zombies, and dealing with Vatican nutjobs, the situation seems beyond hopeless, but many of the characters refuse to give up, and that’s what makes the story quite interesting. I had to read this in one sitting because I really wanted to know why people would bother to keep fighting under such bleak circumstances. The survivors are living in fortified settlements across Europe (often historical structures such as castles), and the zombies – having run quite low on their food source – now move in large hordes composed of thousands, which are building up to millions after overwhelming the settlements one by one. A group of scientists that have been studying the movement of the undead have an idea of how to break up the horde, but their plans are thwarted by some religious fanatics who believe that the zombies are part of God’s will. Be sure to add this new series from the Ministry of Zombies to your holiday list! Many thanks for the kind review.